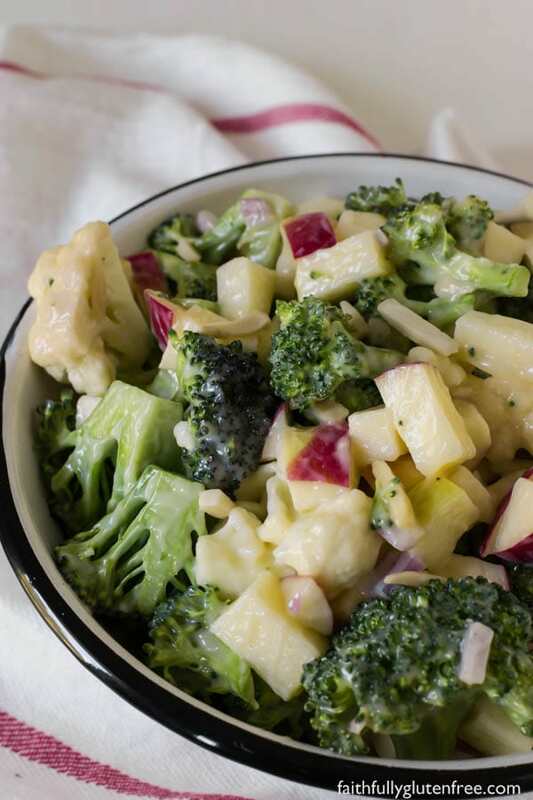 Bring this Broccoli Apple Salad to your next gathering or potluck, and you’ll be going home with an empty bowl. It is just that good! I’m sure we’re all familiar with the broccoli and cauliflower salad that sometimes has bacon or raisins in it. 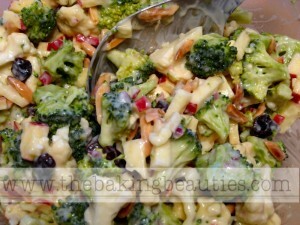 This recipe for Broccoli Apple Salad is similar to those recipes, but I like this recipe even more. The addition of apples and almonds takes this broccoli salad in a whole new direction. Even though you have to cook this dressing, don’t let that stop you from making it. It is a tiny bit more work, but the dressing is SO delicious, you won’t regret it. Trust me! The apple adds a nice sweet crunch to the mix as well. I’ve been making this salad for the past 9 years already, and everyone still loves it. 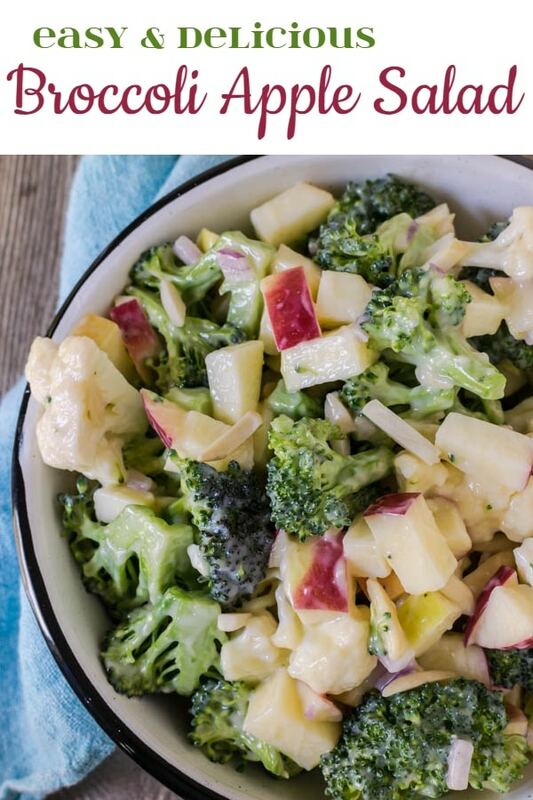 You can prep the dressing, broccoli and cauliflower ahead of time, and add the apple, almonds and onion just before serving. I have used a variety of apples in this salad over the years – usually whatever I have on hand. Gala, Ambrosia, and Macintosh all work great. I don’t bother to peel the apples, I think the red apple skin gives a beautiful colour to this salad (plus, it’s less work). 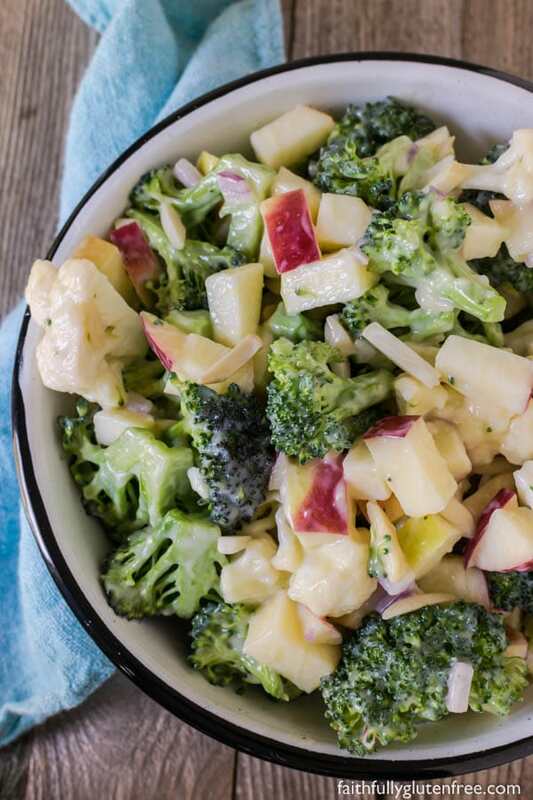 Bring this Broccoli Apple Salad to your next gathering or potluck, and you'll be going home with an empty bowl. It is just that good! In a saucepan, whisk the sugar, cornstarch and dry mustard together. Whisk in the eggs. Add the white wine vinegar and water. Cook over medium-high heat, whisking constantly, until it comes to a boil and thickens.Remove from heat and stir in mayonnaise. Let cool while you prepare the broccoli and cauliflower. Place broccoli and cauliflower in a large mixing bowl. Pour the cooked dressing over, and stir to completely coat. Cover and let marinate several hours. Right before serving, add the remaining ingredients, stirring to coat with the dressing. Cover and refrigerate any leftovers, if you happen to have any. 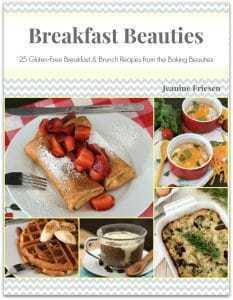 Post and image updated May 2018. Originally posted February 2009. That salad looks really good! That will be on the menu soon! Yum! I’m all about tasty dressings! 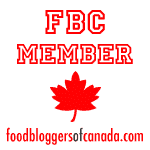 I need to hold on to this…the hope of warmer weather is putting me in the mood for fresh picnic and beach food :). We love the broccoli cauliflower salad around here … and this recipe looks like one we’ll need to try if spring and grilling season ever arrive. I hope all’s well where you are, Jeanine! Glad to hear that, Vanessa! I love it too. Let me know how it works on potato salad. Might want to cut the sugar a little for that, hard to say. I believe I just used a mac apple, Teresa, but there are so many great apples available this time of year, you can use any of them. You can mix it all up hours ahead and just add the apple before serving. Thanks for this Jeanine. I’ve always loved this salad but truly never made it myself. But tonight I did. My hubby doesn’t like it, so I made the dressing and just made up enough veggies for myself. I enjoyed it immensely. I’ve got more ready to mix up for he next couple of days!